There are few better known names in British Art Deco pottery than Clarice Cliff. Together with her Bizarre Girls, she dominated the market for Art Deco pottery in the 1930s. In Clarice Cliff, Will Farmer tells the story of Clarice Cliff and her work. A passionate Clarice Cliff fan himself, Will Farmer will be familiar to many readers as an 20th century decorative arts expert on the Antiques Roadshow. In Clarice Cliff, he provides the reader with an illustrated tour of Clarice Cliff’s life and her work, explaining how the combination of her original design skill and flair combined with Newport Pottery’s powerful marketing machine to create a sensation that remains potently impressive today. Clarice Cliff itself is an A5 format glossy paperback that is filled with photographs of some of Clarice Cliff’s finest work. 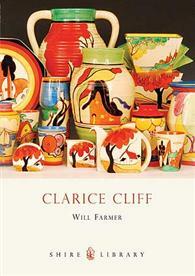 Will Farmer’s enthusiasm for the pottery is infectious and his expert knowledge is genuine, making Clarice Cliff a very easy read and an excellent introduction to the lady and her work. You can purchase Clarice Cliff on Amazon or direct from the publisher. This entry was posted in Reviews and tagged Clarice Cliff, Shire Books, Will Farmer on April 11, 2011 by Perfect Pieces.